Of the 71 Kingston-area athletes who will test their mettle against the best track and field athletes in the province this weekend, perhaps none is facing a more daunting challenge than Cole Horsman. Horsman, the splendid midget-age sprinter from Frontenac Secondary School, has had his way with opponents in eastern Ontario this year. Unbeaten in both the 100 and 200 metres through six meets, he has etched his name in the record book at every meet that mattered. He plies his trade in a discipline, however, where everyone knows you ain’t done nothin’ until you’ve done it against the boys from the Greater Toronto Area, and Horsman gets to meet them this week at the 66th Ontario Federation of School Athletic Associations track and field championships in Toronto. “I think I have a good chance of making some noise there but there’s going to be stiff competition, so that means I’m going to have to raise my game,” Horsman said after breaking the midget boys 100 metres record at the East region qualifying meet in the heats last week, then breaking it again in the final. In no event at OFSAA do the little fish from eastern Ontario find themselves swimming in waters so deep or so infested with sharks. In the last 34 years, only three male competitors from Kingston Area schools have won a medal in the 100 metres, and no one has done it since Luke MacInnis of Kingston Collegiate won senior bronze in 2000. “In the eastern region I did pretty well,” MacInnis recalled on the telephone from New York City, where he now teaches the History of Philosophy to students at Columbia University. “I was running about 11.7 in Grade 9, and when I got to OFSAA, the winning time was an 11.3. Horsman’s time a week ago, 11.15 seconds, was the fastest posted at any of the regional qualifying meets. Of the three male athletes from Kingston who have won a medal in the 100 metres since 1972, only one of them—Dan Brandao of Bayridge in 1999—was a midget and only one of them, Brandao, won gold. “The eastern region, the Kingston area in particular, over the years has had a lot of good sprinters, but never quite the depth that the central and western regions did,” MacInnis said, “so, when you came out of the eastern region and made it to OFSAA, and you realized that it’s not just you and one other guy, but everyone is running fast, the victories don’t come that easily. “People like Wayne Bulak and the Kingston track club were big reasons why we had any competitive sprinters at all, because they gave opportunities to the few sprinters that we had to compete at the provincial level in the club series, so it might not have come as quite a shock to the system in my experience to go to OFSAA and be surrounded by these people, but without that experience it could come as quite a shock to a midget’s system to line up against sprinters who all of a sudden are running 11.2, 11.3, when all season you’ve been facing runners hovering around 12-flat. How does someone facing that type of competitive milieu for the first time deal with it? “I don’t know that I dealt with it very well, because I didn’t run very well until my last year in OAC,” MacInnis cracked. “There’s not much you can do. You have to take the higher level of competition seriously, but what he would want to do is remind himself that if he runs as he’s shown he’s capable of running, he’ll be difficult to beat. MacInnis said it’s easy to let a disappointing race ruin the whole experience, but when you look back, it’s quite an achievement to make an OFSAA final. “The atmosphere is really charged,” he said. “Everyone is really pumped up to see it, so if you’re in the race, you feel pretty good afterwards that you were in it. Horsman said that he’s thought about what it might be like to run at OFSAA. The OFSAA record, 10.89 seconds, has stood since 1981; last year, the event was won—handily—in 11.27 seconds. The Kingston-area contingent bound for OFSAA comprises 71 athletes in 53 individual events and four of eight relays. • Marissa Battle of Kingston Collegiate, who made the final in both events last year as a midget, returns to contest both the 100 and 200 metres for junior girls, as well as run the anchor leg of KC’s junior 400-metre relay team. • Sarah Bell of KC goes into midget girls 100 and 200 metres having posted season-best times in each event last week at the regional meet. 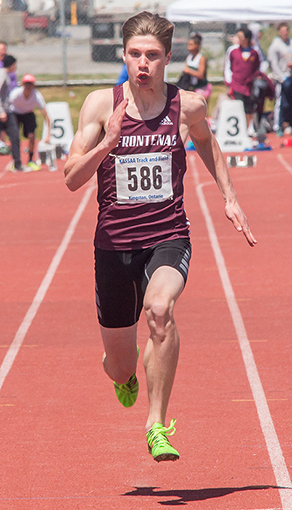 • Jonathan Besselink of Holy Cross goes to OFSAA on the heels of personal-best performances in both of his events, open boys 2,000-metre steeplechase and senior boys 800 metres. • Junior Amanda Black of KC, whose personal-best high jump of 1.61 metres last week was surpassed by only two athletes in regional competition, will also compete in long jump. • Holy Cross midgets Emmett Bravakis and Max Taylor, besides competing individually in the 200 and 400 metres, will run legs in midget boys 400-metre relay. • Ben Cross of Frontenac, who won a silver medal in javelin as a midget in 2012—before coming agonizingly close to the podium, fourth and fifth, the last two years—has the second-best performance in the regionals, but he’s one of seven competitors who qualified at better than 50 metres. He will also compete in triple jump. • Shirley Hughes-Ryan of Sydenham, with two OFSAA medals already to her credit, will race in both the 100 and 800 metres for ambulatory girls. • Regi’s Brogan MacDougall, unbeaten this high school season—with four new meet records in her wake—goes into midget girls 1,500 metres with a time, 4:38.65, that was surpassed last week by only one competitor. She’ll also race the 800 metres. • KC’s Jacquelyn Quesnel has qualified for both the junior girls 800 and 1,500 metres, events where she finished third and fifth, respectively, as a midget last year. • Sydenham midget Liam Sands will contest the 100-metre hurdles and pole vault. • Mavrick Snider, the Bayridge junior who was Top 10 in both events as a midget last year, is back to compete in the long and triple jumps. • Marie-Rivier senior Sophia Skorenky is entered in both the 200 and 400 metres. • Merik Wilcock of Sydenham, who qualified in both the sprint and intermediate hurdles, is unbeaten this year in four meets over 100 metres. • Ben Workman, junior bronze medalist in the 3,000 metres in 2103, will begin competition Thursday in the 1,500 metres, where his 4:00.58 was the fifth-fastest time in the regionals. Besides Horsman and MacDougall, in both their events, Wilcock, in the sprint hurdles, and Cross, in javelin, one other Kingston Area athlete goes into OFSAA on a season-long unbeaten streak. Chelsea Hiemstra of La Salle has won miget girls shot put four weeks in a row, increasing her performance each time. Competition at University of Toronto’s Varsity Centre begins Thursday at 2 p.m., with junior girls discus, where Emily Fawcett of Holy Cross, silver medalist last year as a midget, will compete. It's one of 11 field event finals that will be contested on the first day of the meet, whose schedule also includes heats or semifinals on the track in steeplechase, 400 metres, 1,500 metres and 400-metre relays. Over three days, more than 2,500 athletes and coaches will be participating in a meet that has been touted as the largest—at least the second-largest, only to the California state championships—high school track and field meet in the world. Follow live updates on Twitter: @cscilley.